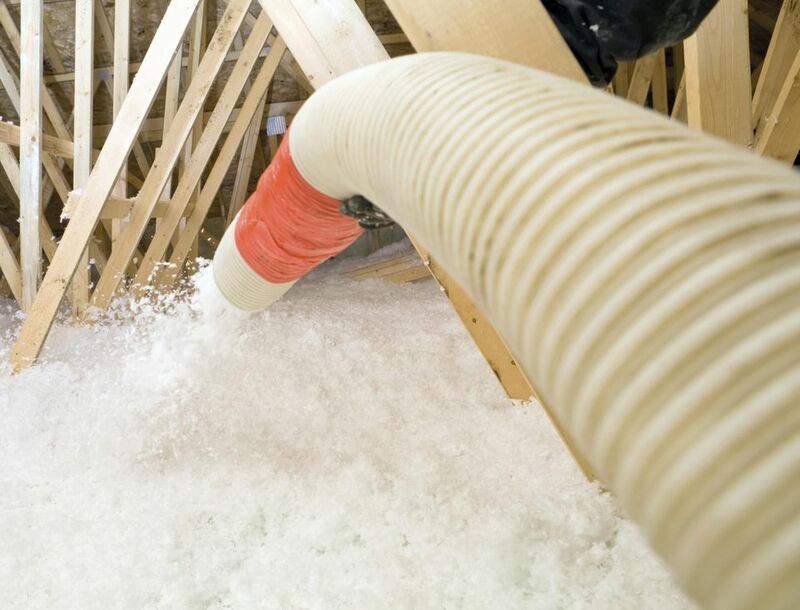 You can significantly reduce energy bills by adding blown-in insulation in your attic. In fact, adding attic insulation is often the single most important step you can take to save on heating and cooling expenses. Regardless of whether you plan to leave your attic empty, use it for storage or finish it for use as living space, adding insulation will save money in the long run. If you do plan to turn the attic into living space, however, the following instructions do not apply. A finished attic should have insulation in the walls and ceiling, not the floor. In older homes, attics often have little if any insulation. In either case, the best way to add insulation is with blown-in cellulose. The project is an easy one for DIYers, and doing the job yourself can easily save you $1,000 or more over a professional job. That's a big ​savings for what should amount to two days of work. Cellulose is a great material for blown-in insulation. It is an environmentally responsible material made from recycled newspapers. It is less expensive than fiberglass, has a higher R-value and is less aggravating to skin and lungs. Also referred to as "natural fiber insulation," cellulose is sold compressed in large plastic bags at home improvement stores. The bags need to be emptied into a blower, which in turn sends the fluffed-up insulation through a long hose. You can usually borrow a blower or rent one for a minimal fee from the same store. A blown-in insulation job requires two people, one to keep the blower full and working and the other to work the hose in the attic. But the important task of preparing the attic is something you can handle on your own. Before heading into the attic, make a map of these potential leak spots downstairs. Use the map to guide you in the attic. Lay some boards or strips of 3/4-in. plywood over the floor joists to provide a temporary walking surface. Take care not to step between the joists, as you will likely put your foot through the drywall ceiling below. If there is already some insulation in the attic, you will need to pull it out of the way while sealing leaks. Use expanding spray foam around gaps 1/4-in. wide or larger and caulk for smaller gaps. Completely fill all gaps. If your house has soffit vents in the eaves, check to see that there are vent channels over them in the attic. If not, or if the existing ones are damaged, install new channels to allow air to circulate properly under the roof. You will need channels in every rafter space. Use a stapler to attach them to the roof deck. Determine the depth of blown-in insulation you will need. The depth will depend on where you live and the R-value of the insulation you use. Cellulose typically provides R-38 at a depth of 10 in. You can determine the level of insulation needed by checking the map provided by the Department of Energy or get a specific recommendation using this Zip Code Insulation Calculator. Use a tape measure and permanent marker to mark the required depth of blown-in insulation on vertical trusses around the attic. Be sure to measure from the drywall surface. If you already have some insulation in the attic, determine its R-value and subtract that amount from the total desired to determine how much new insulation will be needed. Buy a few more bags of cellulose insulation than you think you will need. You should be able to return the unused bags, and it will save you from having to make a quick trip to the store if you run out of insulation before you finish. My local Lowe's and Home Depot both carry GreenFiber Blow-In Natural Fiber (Cellulose) Insulation in bags that measure 12 in. by 15 in. by 24 in. and sell for a bit less than $10 per bag. To achieve R-38 in an attic with no existing insulation, you would need 60 bags of cellulose insulation for every 1,000 square feet of surface to be covered. Both stores provide free blower rental (including 100 ft. of hose) if you buy this quantity of insulation. A detailed coverage chart is available at this site. This now becomes a two-person job. One person needs to feed the blower, while the other handles the hose in the attic. Be sure to read any instructions that come with the blower. Fill the hopper on the blower about 3/4 full, and then turn it on. Break apart the compressed material as you load it, but keep your hands outside the hopper. Some blowers have a sliding gate that is used to control the flow. The person working the hose should start at the far end of the attic and work back toward the access hole. Keep the hose horizontal, about 2 ft. above the surface. You should be able to fill about three or four bays from one position. You may need to push the hose into the eaves. You can also use a broom handle to push insulation into hard-to-reach spaces. Using a sweeping motion, spread an even layer of insulation up to your depth markings. Always blow in the same direction as the joists. Over time, the insulation will probably settle an inch or two. If the blower clogs, turn it off, unplug it and clear the insulation from the hose and hopper before proceeding. How Do You Deal With Sticky Painted Shelves?